Everyone has a special training, nutrition, or general fitness secret. Get the scoop from elite athletes and use their secrets to elevate your own fitness level! Everybody, including celebrity athletes, has secrets. No, I'm not referring to scandalous dirt or shocking rumors about people in the fitness industry! (Let's leave that to reality TV, shall we?) I'm talking about a hidden cache of secrets which athletes keep hush-hush about how they look the way they do, where their strength comes from, or the secret sauce to their training. I secretly enjoy conditioning! If you know anything about me, you know that I love lifting heavy more than anything, but what you don't know is that I love conditioning work just as much. I talk a lot of crap about cardio, and it's true, you wouldn't catch me dead on an elliptical or doing low-intensity, steady-state. But when it comes to cardio work that gets my heart pumping like crazy, I'm obsessed. Maybe it's the adrenaline junkie in me, but I can't get enough of sprints, barbell complexes, jump rope, plyometrics, kettlebell work, and even some short distance (2-3 mile) running. I do conditioning work 2-3 times per week and give it major credit for helping me stay in shape all year long ... Just don't tell anyone! Winky face. I secretly enjoy conditioning! I talk a lot of crap about cardio, but when it comes to cardio work that gets my heart pumping like crazy, I'm obsessed. You don't need to be a strongman competitor to use the lifts! These strongman moves and their variations can help you achieve your goals! For instance, we don't just load an Atlas stone; we have to load them either for maximum reps under time, or, at minimum, a five-stone series. You often find deadlift events in strongman, which also require you to perform a maximum number of reps under time. These events led me to start incorporating this type of lifting into my training. Here's the real trick: 2-3 times each month, pick a major movement, set the weight at approximately 70-75 percent of your max and, after properly warming up, perform one set of as many repetitions as you safely can in 60-90 seconds. 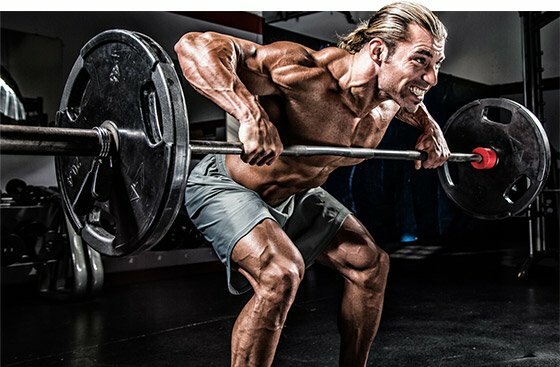 Choose from these exercises to test your guts: deadlift, squat, clean and press, or T-bar row. Write down your max reps and test yourself again down the road to track your progress. If this set does not leave you crawling away in pain and agony, you weren't trying hard enough! Of all the fitness tips, diet tricks, and booty-sculpting workouts out there, my ultimate fitness secret is simple: Stop comparing yourself to others! Instead, constantly work on becoming your fittest and healthiest self. I always say that I'm a work in progress, en route to becoming my best self. Having adopted that mindset has been incredibly beneficial to my health, outlook, and self-confidence over the past couple of years. Sure, at first glance, it's easier said than done. With the onslaught of bikini-clad or underwear "selfies" that have seemingly taken over fitness social media, the physiques of others are right in your face when you log on to Facebook, Instagram, and so on. (It's a bikini booty free-for-all on my Facebook newsfeed!) While some of these posts from fit individuals can be inspiring and motivating, these types of updates are not always that simple. Seeing others' progress, cellulite-free legs and buns, and solid six-pack abs can begin to take a toll on your own self-esteem. Inevitably, they compel you to constantly compare yourself to others and how your progress or fitness stacks up against theirs. Admire the physiques and hard work of your favorite "fitspos," but always keep in mind that the reflection in the mirror is your real competition. Be in competition with yourself, striving to become better each and every day. That is the true secret! When I'm trying to manipulate water for shoots, I take full advantage of infrared saunas. An infrared sauna is an effective tool for detoxifying the body and an aid for shedding excess subcutaneous water, yet few people utilize it. While traditional saunas help with water loss, the added benefit of infrared light penetrates the body tissue to help excrete toxins and bring out your musculature. This has been a trick that I've used to come dialed into photo shoots and contests for years. It really makes a difference! Embrace the valuable information that contributes to these athletes' success and see how it could fit into your own life and goals. Have you got a secret method few people know about? Tell us in the comments below ... unless you'd rather keep it secret. The word ''alpha'' gets thrown around a lot these days. Before you start slapping the label on yourself or anyone else, take this leadership course from the fittest man on Wall Street!